In many separation processes, especially in health protection applications, it is very important to stop a process or replace a filter/adsorbent device before any of the contaminants can do any damage or harm. In many cases, the presence of other adsorptives, e.g. water in the form of vapor, plays an important role and influences the performance due to co-adsorption and other effects. There are also applications without any regeneration. Here a breakthrough curve can be used for determination of the production time of the adsorber unit. A typical application is the removal of traces of H2S from biogas with KI impregnated carbon. PSA (Pressure Swing Adsorption) is one of the key techniques in industrial separation processes. This technology is mainly used for hydrogen purification, air separation and purification of methane from methane-rich gas mixtures (e.g. biogas). Due to the low energy requirements and feasible short cycle times the PSA process is a preferred separation technique for a wide range of product quantities. Depending on the application and the used sorptive material, the separation is based on thermodynamic effects or kinetic-steric effects. In the case of thermodynamic effects, a separation can be realized by different loadings of the adsorptives on the surface, which is related to the different sorption isotherms. The kinetic-steric effect is based on differences of the sorption rates for the adsorptives. For some material/adsorptive systems the molecules of one species is too large to enter the pores. In such cases, steric effects are responsible for the separation. An another widely used classification of PSA processes is related to the desorption pressure. 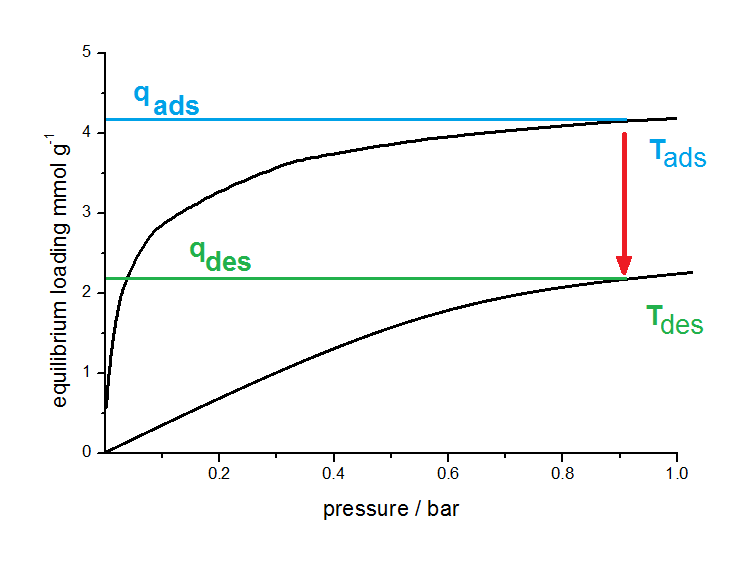 Depending on this pressure a discrimination between PSA (Pressure Swing Adsorption) and VPSA (Vacuum Pressure Swing Adsorption) can be found in literature. The idea of the pressure swing principal is shown in next figure on the basis of a schematic isotherm. Principle of PSA. The working capacity is between qads and qdes. By varying the adsorption and desorption pressure this working capacity can be changed in accordance with the isotherm (black curve). Adsorption takes place at higher pressures (e.g. 8 bar) and the adsorbent has an equilibrium loading, corresponding to the isotherm (black curve), of 7.1 mmol per gram. By reducing the partial pressure of the impurity to 1 bar with purging and reducing the total pressure, the adsorbed amount decreased along the isotherm (in the shown case down to 2.0 mmol per gram). Between both pressures the material will have a working capacity of 5.1 mmol per gram adsorbent. Usually, the PSA process is a sum of complex cycle steps and very often more than two adsorbers are involved. In this example only a simplified process with 4 cycle steps and the production during the adsorption step will be discussed. We will only focus on the left adsorber. 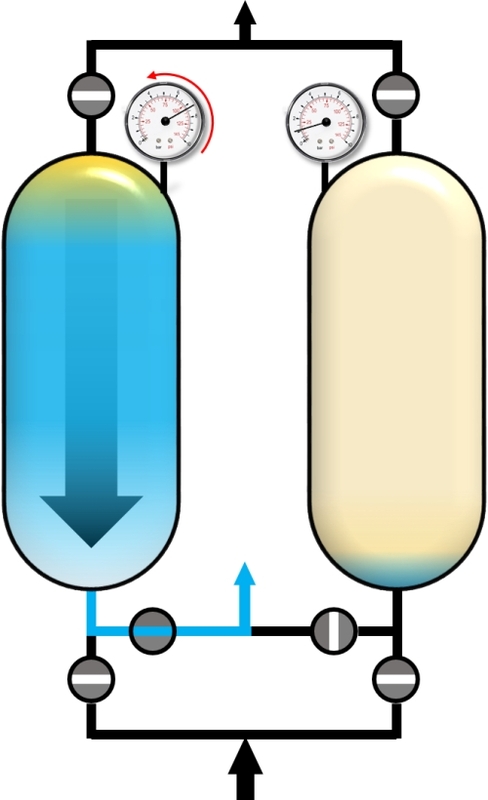 Before the adsorption of impurities (blue), the adsorber has to be pressurized to the desired adsorption pressure. This can be realized with pure product (yellow) in counter current flow. After reaching the adsorption pressure (or somewhere in between), the adsorber can be supplied with the gas mixture (green) in co-current flow (upstream). The time of this cycle step is the production time and the outflowing gas is the desired and purified component. 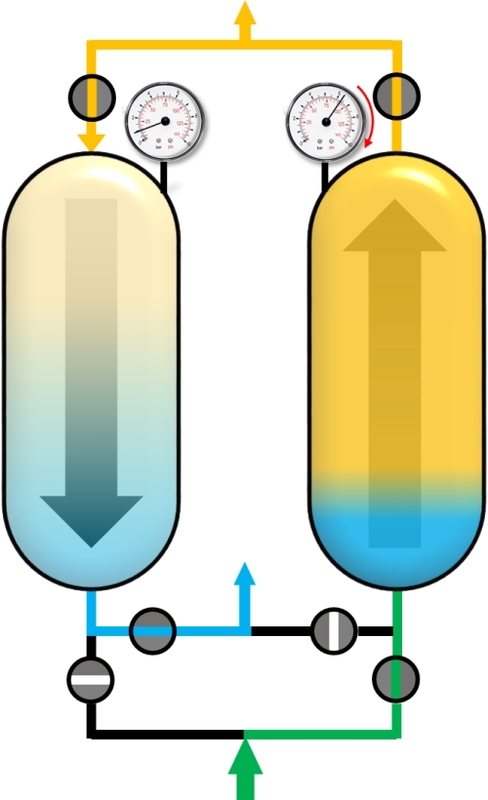 A portion of the purified gas (yellow) is used to purge the second adsorber that has a lower pressure. When the concentration of the impuritiy (blue) exceeds a pre-defined threshold, the adsorber is saturated with impurities and has to be regenerated. For this purpose, the pressure in the adsorber is reduced to the desoprtion pressure. This is done by the so-called blow-down step. 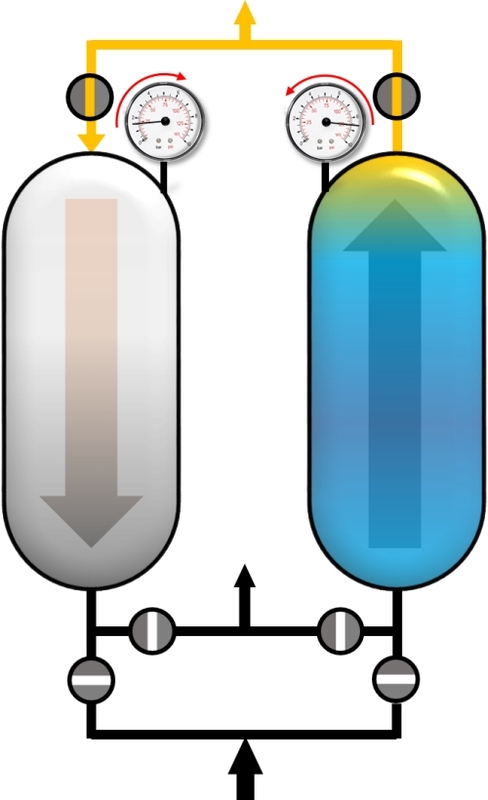 The gas phase within the adsorber expands in counter-current direction and a main part of adsorbed molecules desorbs into the gas phase and flows out of the adsorber. 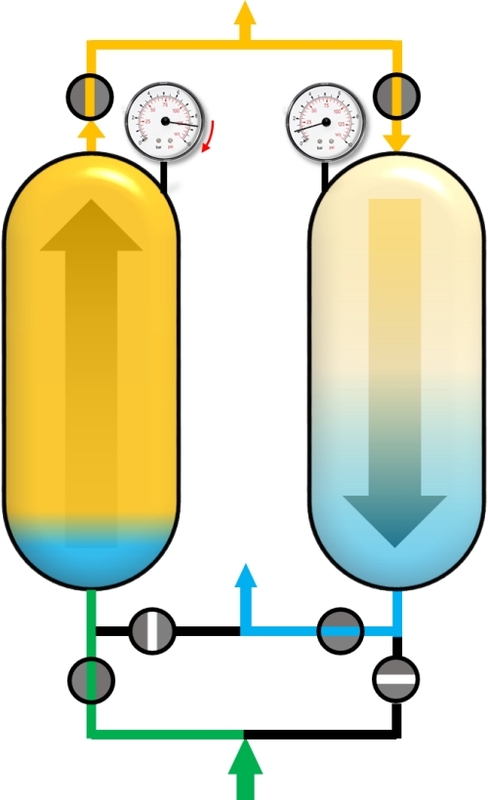 The last step is a purge step, where the adsorber is regenerated with pure product (yellow) in counter-current flow for further removal of the impurities by reducing their partial pressures. After the last step, the cycle starts again from the beginning. For a two bed adsorber plant, the second adsorber has to perform its Blow-Down, Purge and Pressurization steps in the time that the first adsorber is in production mode. In the following figures all cycle steps are shown for a dual-adsorber plant. TSA (Temperature Swing Adsorption) is widely used for the removal of volatile organic compounds from exhaust air, drying of gases, and for CO2 removal by zeolites with narrow pores. 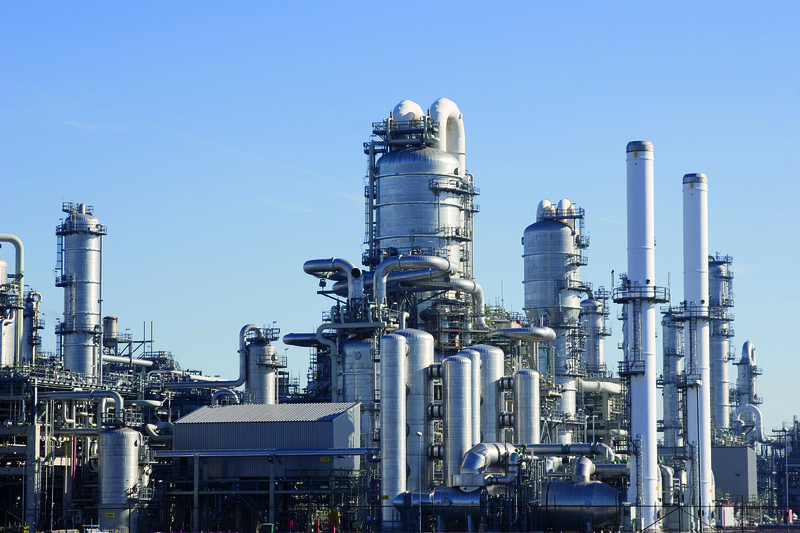 Such processes can be found in petrochemistry, the upgrading of natural gas, air separation and cleaning of synthesis gas. With this technique it is possible to remove adsorbed molecules which have a strong adsorptive-adsorbent interaction. 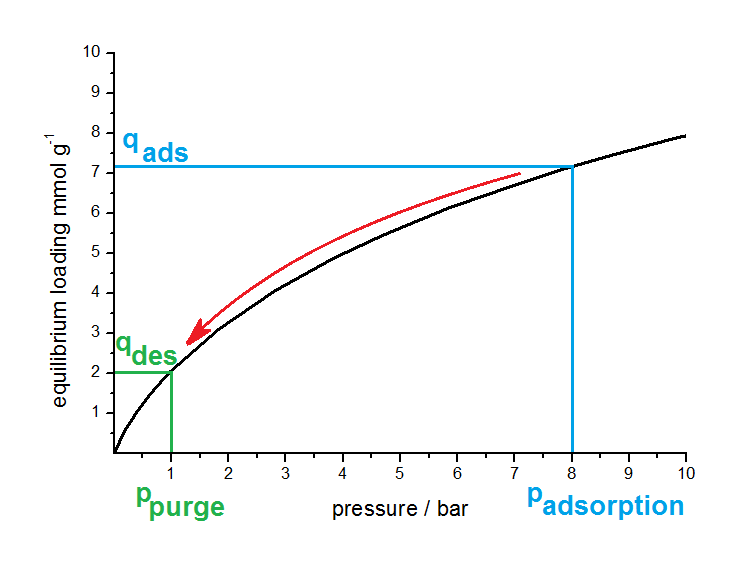 Often, the reduction of the partial pressure is not efficient enough to regenerate the adsorbent. For this purpose, different heating techniques can be used, such as hot intert gas, electricity or hot water vapor. In case of the adsorber regeneration after VOC-removal, water vapor at approx. 130 °C is flushed through the adsorber for desorption. Therfore in practise it is often a combination of a temperature and a displacement effect that plays a major role for this kind of regeneration. Principle of TSA. The working capacity results from isotherms at different temperatures (black curves). By varying the adsorption and desorption temperature this working capacity will be changed. Adsorption takes place at a lower Temperature (Tads). After saturation, the adsorbent has an equilibrium loading qads according to the isotherm at this temperature. Now the temperature will be increased to Tdes. Due to the temperature dependence of the isotherm a new equilibrium will be formed with a lower sorption capacity qdes. In the schematic figure, a working capacity of 2 mmol per gram adsorbents was obtained. R. T. Yang, Gas separation by adsorption processes, Imperial College Press, London, 1999. D. M. Ruthven, Principles of adsorption and adsorption processes, Wiley, New York NY, 1984. W. Kast, Adsorption aus der Gasphase. Ingenieurwissenschaftliche Grundlagen und technische Verfahren, VCH, Weinheim, 1988. D. Bathen, M. Breitbach, Adsorptionstechnik, Springer, Berlin, 2001.